Chocolate fudge is an all time favourite with my family and I’ve posted a few versions here and here. Choco fudge is quite simple to make but this version is even more simpler and healthier too, as I have also added some Oats to it. 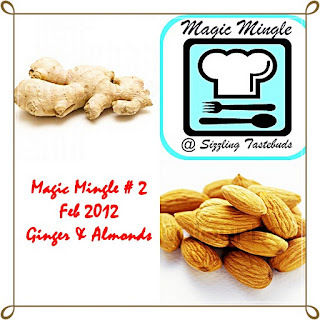 This month’s Monthly Mingle had two interesting ingredients to use Ginger and Almonds. I had many thoughts in my mind but I finally got fixed on a sweet. Making sweets is rare thing at my place for obviously fatty reasons but I could not ignore the fact that the kid had been asking me to make the Choco-muesli bars once again. So, I used the concept of Muesli bars and fudge together, at the same time, did not forget the Monthly Mingle ingredients and came up with this recipe. I assure this is very tasty and at the same time extremely healthy too. It is not overly chocolaty but there’s just right balance of all ingredients. The ginger is just enough to add the right zing. It is a power pack snack for kids after they have played. Melt Chocolates on a double boiler and add half the butter. Mix. Add the ginger powder, nuts and oats. Mix. Finally add the remaining butter and spoon it immediately in small cup cake liners. Level and refrigerate for half an hour. yummilicious!what a lovely mix of flavours. Such an yum n scrumptious fudge with oats n beautiful clicks !!! wow ! tht looks so yum ...i can surely give it a try .. I can't believe it was that quick!! Very delicious and mouthwatering choco fudge. These looks so... tempting! Great presentation! So inventive and magnificent recipe !! Looks so delicious !! yummy fudge....addition of oats is fabulous.. Very delicious n yummy !! Delicious fudge! I'm intrigued by the addition of ginger, would so love to taste this now. A chocolaty treat with a healthy edge...looks yum! Yummy delight for the season. Nice recipe. YUM!! !